Help keep Nantucket's Community Sailing! The cool fall air has settled in and the Grey Lady is celebrating the changing of the seasons. As we look back on the warmer days of the summer past, we cannot help but feel grateful for all the wonderful memories made with our sailors. 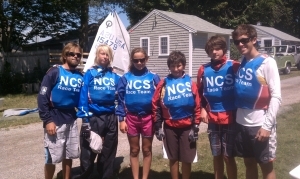 The summer of 2012 was filled with fun, safe and exciting sailing. We hope that when you and your sailors look back on the summer, you have the same sense of enjoyment. Over the past month we have been spending time reviewing the programs that we offer and by interviewing all of our outgoing seasonal employees, we hope to determine areas that may benefit from change, and areas where we can positively grow. We have also dedicated an enormous amount of time to washing, storing, inventorying and repairing our equipment. This allows us to determine, in conjunction with the review of our programs, what types of items we may be looking to add or replace for the upcoming summer season. Last fall, we recognized the need for three new 420's, a new 2-piece opti float, two stand-up paddleboards, two new engines for our skiffs, and a variety of parts and pieces to help keep our fleet in good condition and through the support of our NCS families and friends, we were successful in acquiring those items. It was easy to see that the new equipment made a positive difference in the quality of instruction we were able to offer and we couldn't have done that without your help. Looking forward to our 2013 season, we have begun to identify some of our needs for next season and have started to compile a "wish list" that will help achieve our goals for the upcoming season. In addition to our annual program and cycling needs, we hope would like to enhance our programs and their efficiency by adding the following items: an off island coach/safety boat & trailer, another support boat/skiff for our Polpis location, new electronics for our J/105 "Clio", five new kayaks and more paddleboards. These items, along with other pieces of equipment, will help to ensure that each boat is properly outfitted for safe and enjoyable sailing. It is with your generosity and support that we believe we can accomplish these purchasing goals. Please consider making a donation today to Nantucket Community Sailing's Boats & Equipment Fund; any financial support you are able to provide will be greatly appreciated. For more information on how to donate, click here. If you have recently given to NCS, thank you for your gift! We greatly appreciate your consideration and support in helping to keep Nantucket's Community Sailing. Starting to think of your holiday shopping? Click here for a few Fall Specials still available through the NCS store. Items and promo's are only available while supplies last.